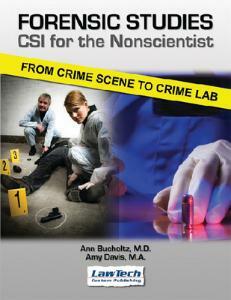 Offer students a thorough introduction to the fascinating field of crime scene investigations. This comprehensive text begins with crime scene search, investigation, and documentation techniques. Following a typical investigative path, continuing chapters examine fingerprints and other evidence, including trace, biological, DNA, impressions, and firearms. Questioned documents, computer crimes, and drugs are also described in detail along with forensic applications for toxicology, entomology, botany, anthropology, and odontology. A final discussion is devoted to arson investigations, the court system and testimony, death investigations, and career opportunities. Softcover, 335 pages.